Ingredients (PVC/UPVC + additives) — Mixing by mixer and feeding — Extruder — Pipe extrusion mold — Vacuum tank — Cooling tank (optional) — Inkjet printer (optional) — Haul-off unit — Cutter — Stacker/Belling machine — Finished product inspection — Packaging and storage. 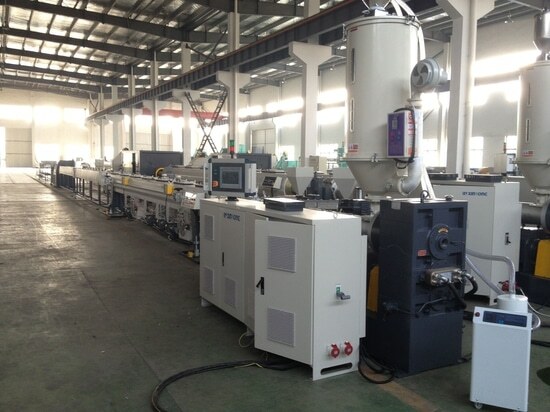 service life, so the overall cost is low.PVC pipe extrusion line is the plastic extrusion production equipment which specialized in producing PVC (polyvinyl chloride) pipe. 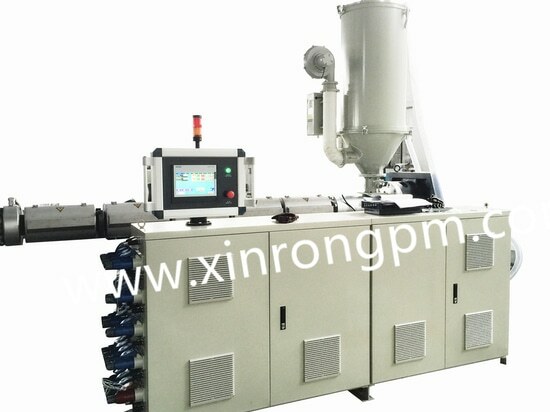 The basic production process is as follows: Ingredients (PVC/UPVC + additives) — Mixing by mixer and feeding — Extruder — Pipe extrusion mold — Vacuum tank — Cooling tank (optional) — Inkjet printer (optional) — Haul-off unit — Cutter — Stacker/Belling machine — Finished product inspection — Packaging and storage. PVC pipes are widely used for water supply and drainage because of the following characteristics: 1.Light weight, convenient for handling and loading, easy for construction. 2.It has excellent acid resistance, alkali resistance and corrosion resistance, and is suitable for the chemical industry. 3.The inner wall of the pipe is smooth, its roughness coefficient is only 0.009, and the fluid resistance is small, which effectively improves the hydraulic conditions of the pipe network and reduces the operating cost of the system. 4.High mechanical strength: The pipe has good pressure resistance, impact resistance and tensile strength. 5.Simple construction: PVC plastic pipe connection construction is quick and easy, and construction engineering costs are low. 6.Low cost: low price, convenient transportation and construction, long 7. 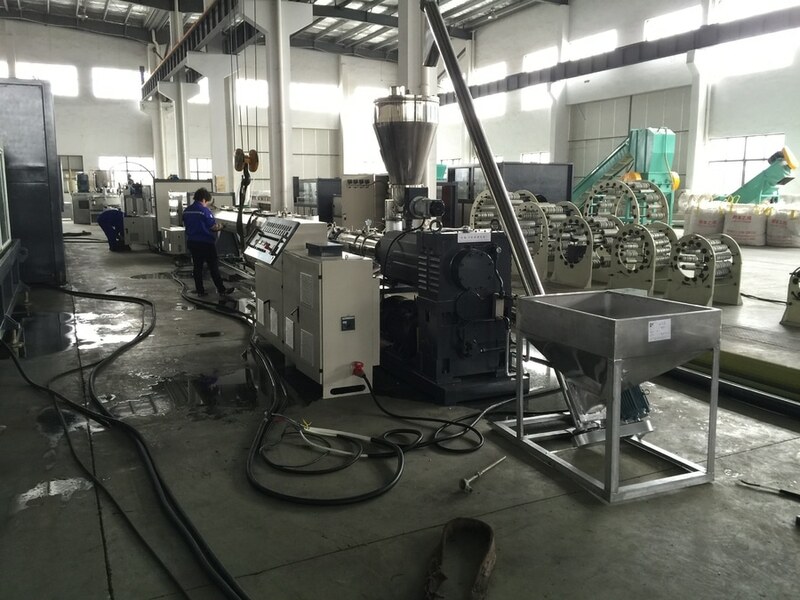 No effect on water quality: It is confirmed by the dissolution test that it does not affect the water quality, and is suitable for large-scale promotion and application. 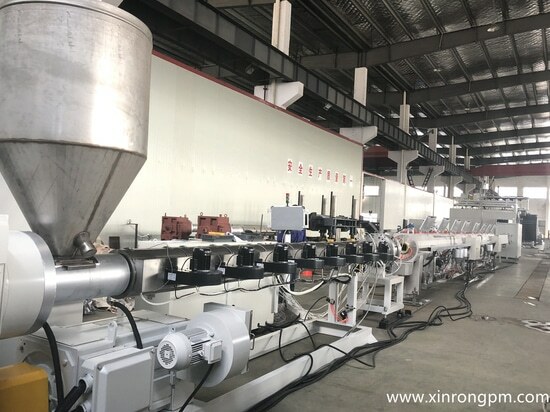 PPR pipe extrusion line is developed by XinRong based on European advanced technology and R&D experience of the plastic machinery for many years. 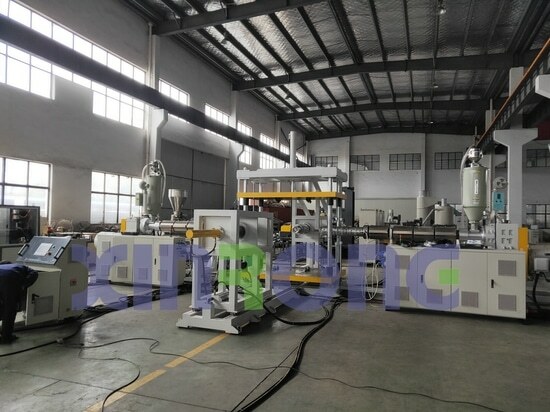 Advanced design,reasonable structure, high degree of automation and high reliability.